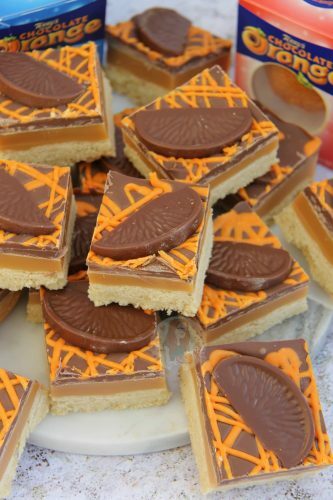 Buttery Orange flavoured Shortbread, Delicious Homemade Caramel, and Terry’s Chocolate Orange Goodness on top. Perfect Christmas Traybake! 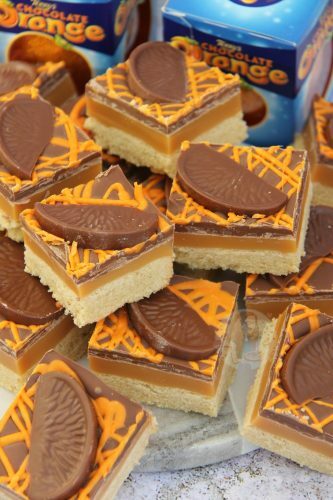 So, yeah… Chocolate Orange themed Millionaires Shortbread anyone?! Honestly, I have wanted to post this recipe FOR SO LONG but I wanted to hold off till Christmas time. 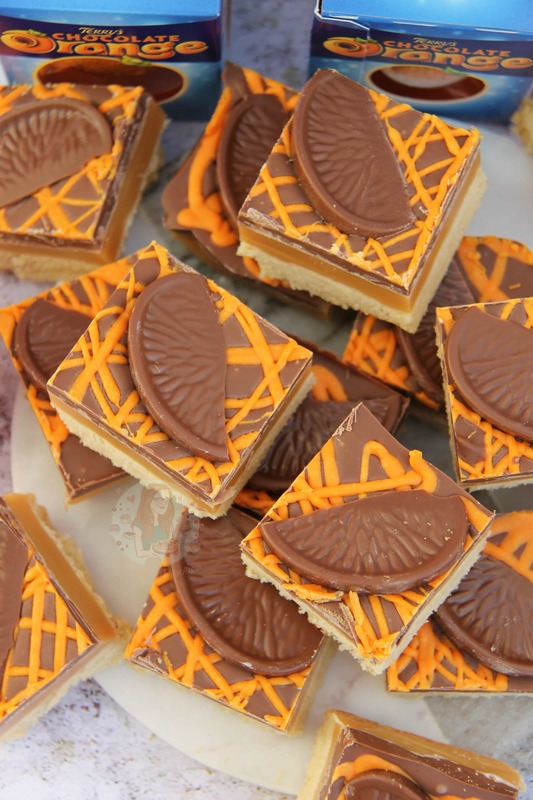 I simply adore Terry’s Chocolate Orange and I simply adore Millionaires Shortbread, so this recipe was a bit of a given. 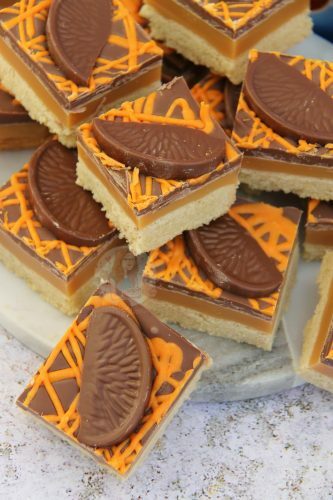 I’ve made this several times, and I adore the extra Orange in the shortbread, rather than just the chocolate orange melted on top. I decided to go quite similarly along the lines of my Salted Caramel Millionaires Shortbread as the recipe is just so popular and works so well. 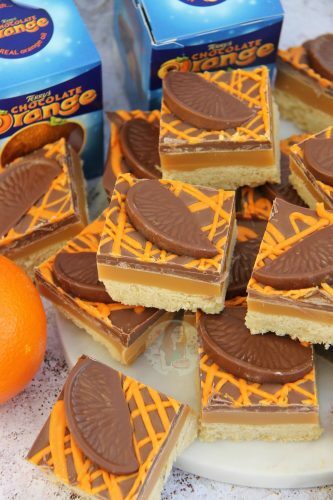 It was quite simple to adapt to make it Christmas themed by using Terry’s Chocolate Orange on top, and drizzling over some Orange Coloured chocolate as well. Also, using the Orange flavouring in the shortbread gave it that extra kick I wanted. 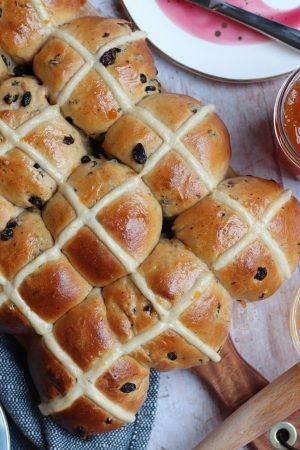 Of course, this is optional, but its OH SO YUMMY and moreish. When I gave these to my Trusty Taste Testers, they devoured them. I realise I say this a lot, but I have a hungry bunch of Taste Testers, and if they don’t like something, they do say! I obviously used Terry’s Chocolate Orange, but you can use whatever flavoured chocolate you like. Even the Lindt chocolates for example, or a flavoured cadburys chocolate! For the caramel, you REALLY have to work on it. You can’t use a tin of carnations caramel and stick it on top as it doesn’t set. You can’t really skip the steps, as it really is a caramel. I don’t often make my caramels from complete scratch as many of my readers prefer the easier versions, and I get that. You have to make sure to stir the caramel a lot to prevent it from catching and burning. I use a medium level of heat, and a larger pan so its easier to stir. You have to be careful as it obviously does get VERY hot, but its worth it. It is delicious and heavenly. Terry's Chocolate Orange Millionaires Shortbread! Cream together the sugar and butter in a stand mixer with the paddle attachment until smooth – mix in the flour and orange zest until a dough is formed. It will be crumbly but the ingredients will be evenly dispersed! Firmly press the mixture into the bottom of tin and bake in the oven for 20-25 minutes until pale golden on top! 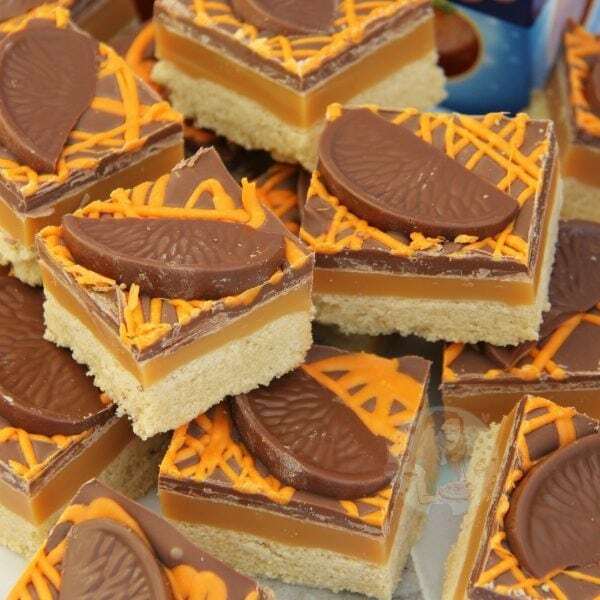 Once set, melt the chocolate orange and pour over the caramel – melt the white chocolate and mix with a little orange food colouring and swirl it into the chocolate orange with the end of a cake skewer so it forms a pretty pattern or just drizzle it over. 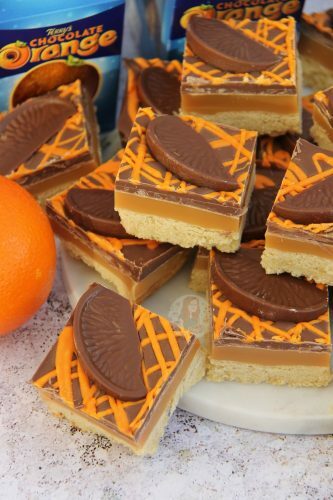 Put a chocolate orange slice on it for each piece when you eventually cut it. Chill the Shortbread back in the fridge for another 1-2 hours until the Chocolate has gone hard**! 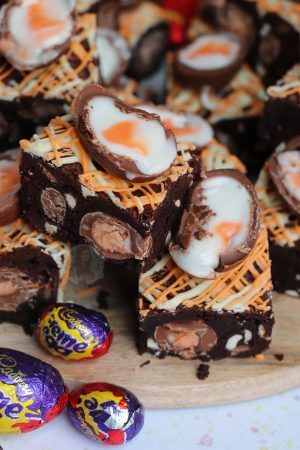 You can use normal Milk Chocolate if you wish, or even use orange extract to flavour it this traybake. 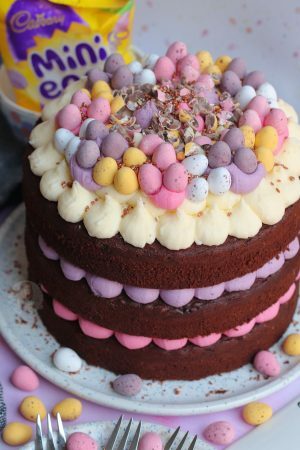 Find my other Traybake & Christmas Recipes on my Recipes Page! Older Next post: Rolo Rocky Road! Newer Previous post: Candy Cane Brownies! Hiya – do you mean to get the caramel off the pan? Add some water and boil the water to warm the pan through and then clean. If you mean to stop it happening during making the caramel, turn the heat down a smidge and make sure to use a spatula that scrapes the bottom so nothing is left there too long to burn. My caramel came out a bit grainy, do you know why this might be? 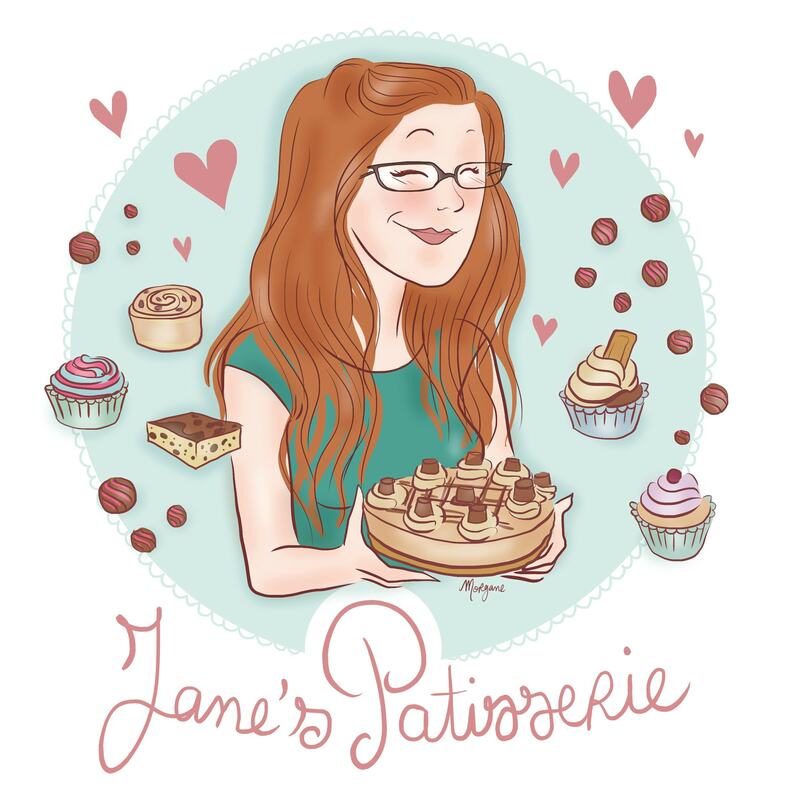 Sometimes it just will be differently coloured – also, you have to remember lighting can affect a photo/video, so as long as its sets and is tasty the colour doesn’t matter so much! Also, I boil mine for 5-7 minutes, so 3 minutes would be a lighter caramel colour. Golden Syrup is a syrup available in the UK, you will need to google your alternative. What temperature on a sugar thermometer should the caramel be when ready. I feel it would be much more helpful if you wrote that as part of the recipe. As you can see from the recipe, and every single other Millionaires recipe on my blog, and when googled any recipe I have seen of Millionaires Shortbread, they don’t state a temperature. There isn’t a temperature to boil it too, its the timing. I feel it would be much more helpful if you gave it a go first. 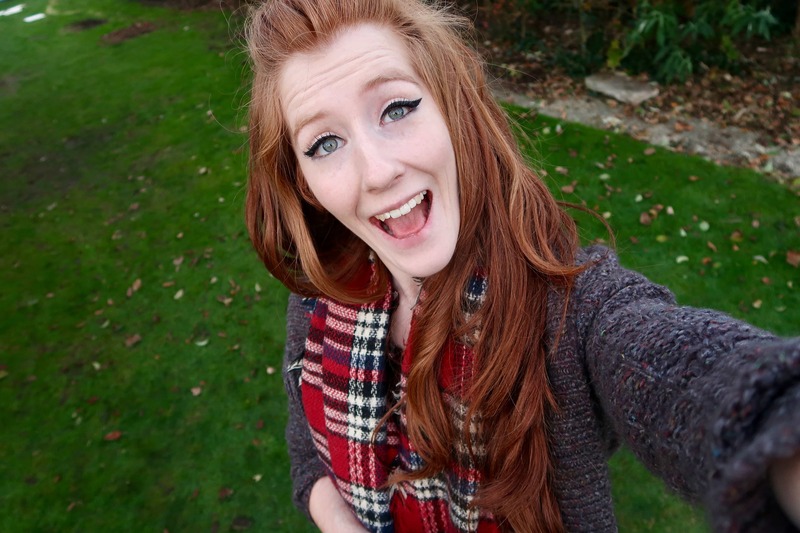 I’m not sure if Lorraine though that was hilarious….. Poor Lorraine. Hello 🙂 These look amazing, can I use tinned caramel? You over did it – try a couple less minutes next time. if substituting the orange zest for orange extract, how much would you add? 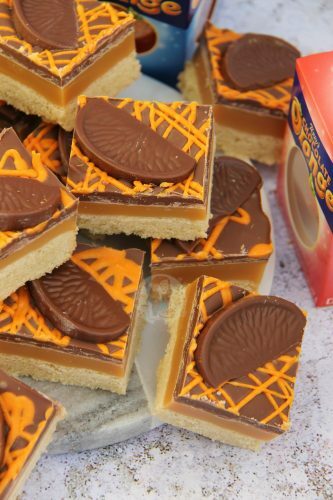 Is there a way of making the caramel slightly orange flavoured? Would it even be possible to make a seasonal alcoholic version with cointreau in it? You can add orange zest to the caramel, but the alcohol might affect the consistency of the caramel. Just reading through the ingredients/recipe, I notice your title for the caramel is salted caramel but you use unsalted butter and no other salt addition so wondered how the caramel becomes salted – or have I missed something! No its just meant to be Caramel – writing multiple recipes at once I wrote the wrong thing haha sorry!